The fee - up to £52.6m with add-ons - will surpass the £42.4m Arsenal paid Real Madrid for Mesut Ozil in 2013. "He has very interesting technical qualities and a strong character," said Gunners manager Arsene Wenger. The 26-year-old is expected to travel with the squad this weekend for two friendly matches in Sydney next week. Those games will be followed by a match against Bayern Munich in Shanghai the following week. Lacazette, who has won 11 caps for France, was the second-highest scorer in Ligue 1 last season with 28 goals. He netted 129 goals in 275 matches in all competitions for Lyon after breaking into the first team in the 2009-10 campaign. His league tally last season was bettered by only Paris St-Germain's Edinson Cavani, with 35. Wenger added: "We are very happy to have Alexandre join our group. He has shown over a number of years that he can score goals and that he is a very efficient finisher. "So he is a guy who is a great addition for us, and someone who will help us challenge at the top level this season." Lacazette has been linked with several top clubs and looked set to join Atletico Madrid before their transfer ban was upheld by the Court of Arbitration for Sport. Last week Arsenal chief executive Ivan Gazidis promised fans "top-quality" summer signings during a question-and-answer session. Left-back Sead Kolasinac, who joined from Schalke, is Arsenal's other recruit since the end of last season. 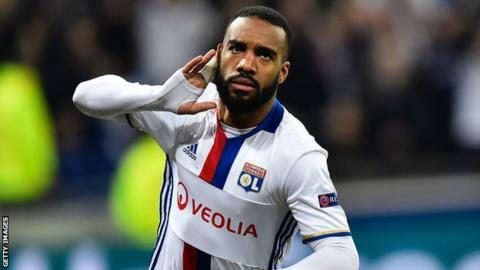 The player Arsenal really wanted this summer was Alexandre Lacazette and sources there tell me his arrival is another signal that the club are deadly serious when they say they want to become top-flight champions. Although breaking the club transfer record does not guarantee anything, acquiring Lacazette proves Arsenal and Wenger can still attract top players, even without Champions League football. Arsenal do have other targets but whether or not more signings are made is likely to depend on what happens with the likes of Alexis Sanchez, Mesut Ozil, Alex Oxlade-Chamberlain and Jack Wilshere, all of whom are out of contract in a year's time and have been linked with moves away from the Emirates. Arsenal's first-team squad is currently far too big and players need to leave before any more arrive. I think it is a very good signing for many reasons. Not just for spending the money but he is 26. The first time Arsenal scout Gilles Grimandi went to watch him was 10 years ago and already then Arsene Wenger had an interest in him. They have looked at him so many times, year after year and were not always convinced. Sometimes he was 'yes', sometimes it was 'give him a bit of time'. On this occasion, Wenger is convinced it is the right time for him. Lacazette has matured and improved massively.